You never forget your upbringing. Steve and Lorri Zeller reminisce about their childhood and fondly recall their days spent as high school sweethearts. Dating eventually led to marriage and then to raising a family of their own. The Zellers remember the fun of raising their three boys, who would all eventually go on to play in the NBA. Bob: Steve and Lorri Zeller have raised three sons who have all gone on to play basketball in the NBA—Luke, Tyler, and Cody Zeller. Lorri says there were not a whole lot of rules around the Zeller home, but the rules they did have were significant. Bob: This is FamilyLife Today for Thursday, March 31st. Our host is the President of FamilyLife®, Dennis Rainey, and I’m Bob Lepine. We’ll talk to Steve and Lorri Zeller today about what it takes to be the parents of three outstanding young men who have all gone on to compete at the highest level in their sport. And welcome to FamilyLife Today. Thanks for joining us. Well, just about everybody is paying attention to basketball this time of year. Bob: Yes, just about everybody [Laughter]—and anybody, who is not—ought to be paying attention to it. Bob: This is a great time of year for basketball. Dennis: It is a great time of the year! We’ve got a great pair of people to talk to. Steve and Lorri Zeller join us on FamilyLife Today. Steve, Lorri, welcome to broadcast. Steve: Glad to be here—thank you. Lorri: They have all been in the NBA—either currently there or they have played in the NBA. They’ve been blessed with height—they’re all about seven feet tall. They’re basketball players on the court, and they are great people off the court. Dennis: Well, let’s go back, Steve, to where you started out. Steve: I’m the youngest of twelve—I have five older brothers and six older sisters. We grew up in Iowa, and it was a small farm house. There was actually only a four-bedroom home, and one of those bedrooms was Mom and Dad’s. The rest of us split up the rooms. Bob: So, how many brothers were in the bedroom with you? Steve: Four boys—myself included in the one room. So, it was—you learned to share. Dennis: Lorri, what about you? What kind of family did you grow up in? Lorri: I grew up in a very calm household compared to the Zeller household. I had two older brothers who were ten and twelve years old than myself. So, I obviously was the only girl. I was kind of the baby of the family, and I was in kindergarten when my eldest brother left for college. We were that far apart in age that we kind of grew up differently but in the same household. Dennis: Steve, your dad was a giant in your life, just in terms of impact and influence. Share a little bit about who he was and how he impacted your life. Steve: Dad was—had somewhere south of a sixth-grade education—but one of the smartest guys I knew. He left home—he was the oldest of six—left home and had to be able to give money back each week when he came home for the weekend to be able to pay for things at that time because it was during the Depression. Then, he went off to the service, fought in World War II, and came back. He was a no-nonsense—showed very little emotion—he was a man’s man. I always tell everybody that he never said, “I love you”; and it was something I was raised at. But one story that I always tell about my dad is that one Christmas Eve—one of the traditions—if you can imagine twelve kids in a small farm house—we always had it at Mom and Dad’s. As soon as we got done opening—we went off to play with our toys and stuff—he would pick up everything in a trash bag / all those wrappings in a trash bag. I was about six years old. I decided, “Hey, I’m going to go see what he does with that!” So, he goes out, and it’s a cold night in the middle of the winter in Iowa. He goes in behind the garage, and we’ve got a burn-barrel back there—we burn up the paper. And he would put that paper in there, and he’d get it just right. I realized my hands were starting to get cold; and he finally lights it, and the flames start building up. There are oak trees up above, and I start noticing that those oak trees—that light starts dancing back and forth—it’s kind of neat. Just then, I noticed / I felt warmth of that hard, calloused—he was a farmer—reach down and grab my hand, and he just held it for that moment. I know that he never realized how important that moment was to me; but at that point—and at many other times—I just knew that Dad loved me even though he didn’t say it. And yes, he did a lot for us—a man of few words but the word he said were worth listening to. Bob: There were character issues, for you, growing up. I mean, he and your mom, both in this environment, made sure that you boys knew right from wrong / your sisters knew right from wrong. You were raised with an expectation that you were going to be honorable young men and women; right? Steve: Absolutely. That was the most important thing to them—was that we were honorable men and women and that we had high character. Bob: And there was a spiritual element in your home as well; right? Steve: Yes. We were raised Catholic, and we went to church every Sunday. When Lorri and I met, and we sat down and talked about: “Okay, she’s Lutheran / I’m Catholic. What religion are we going to raise our kids?” because there was no question we were going to raise them the same religion—just which one. We ended up choosing the Lutheran end of it, and it was important to us because of the background. Bob: And Lorri, you grew up in a home, again, spiritually-focused / spiritually-centered. Character was an issue for you—really similar to what Steve grew up with; right? Lorri: Yes, very similar. We went to church on Sunday. Dennis: How did you two meet? Lorri: We were high school sweethearts. I was a year ahead of him in high school. He will tell you that I invited him to my junior prom. Dennis: So, you asked him out? Lorri: I did. I had to because he was a sophomore, and sophomores couldn’t go to prom unless they were invited by an older classmate. So, yes, I had to ask him to my prom. Dennis: And your dad hadn’t read my book, Interviewing Your Daughter’s Date; [Laughter] but he knew how to protect his daughter; didn’t he? Lorri: Oh, he did. He was—obviously, I was the only girl. When Steve came to pick me up for a date—there was a time when I was still upstairs getting ready. Bob: Well, he did catch you pitching woo one time; didn’t he? Dennis: Well, now, wait—what’s pitching woo? Bob: Oh, come on! [Laughter] You didn’t grow up in Iowa; did you? Dennis: I didn’t. [Laughter] There are a lot of people who didn’t, Bob! Steve: Dennis, we were making out. Steve: It was late at night. We had kind of a system down, where we would be able to kiss on the couch. It happened to be—we were lying on the couch, watching The Tonight Show, back then. Bob: —and you don’t recommend. And you would not have let your boys do this. Dennis: So, how did you end up proposing? Who gives the juiciest side of this story? You’ve got a big grin, Lorri. I think I’m going to get a better story out of you. Lorri: You know, nowadays, proposals are well thought out, and very romantic, and usually the boy goes and asks the dad for permission. Steve and I—it was just a natural progression. We dated in high school, we were through college, and we just—we always knew, for several years, that we were going to get married. So, I kind of picked out the ring. Steve was working—he made payments on it. The jewelry store held it until it was paid off. One spring break, Steve was just supposed to go pick up the ring for me so we could be engaged. That particularly day, he walked in. He had an end table—and we were starting to collect furniture—and he had an old end table from his sister. He said, “Hey, what do you think about this end table for the house?” I said, “What about the ring? !” He said, “Oh, they didn’t have it ready yet.” So, I kind of look at this end table and pull open the drawer; and there is the ring inside the drawer. It was not real romantic, you know—it wasn’t anything elaborate. Bob: —and found out there were bigger boys at Iowa State than where you’d grown up playing. Bob: Right. So, both of you had had athletics as a part of your life. When you got married and started having boys, did you think, “It’ll be fun to have the boys involved in sports”; or had you—I mean, was that intentional that you were going to grow them up playing sports? “Maybe, they were going to be a piano player when they grew up.” We just wanted them to do something that was fun for them and something that they enjoyed. Dennis: Well, as they began to excel, I know, Steve, you began to press into their ability to perform sports and actually had a God-moment, where you felt convicted you were overdoing it. Steve: Yes; it was, actually, Luke, our oldest son, when he was a sixth grader. Luke was tall for his age—over six feet—so, he ended up playing in the AAU. I was doing the father-thing. I was making sure that I had the right AAU team. I did all the research, interviewed coaches, tried to do everything I could to make sure he was in the right spot. Ended up—in my infinite wisdom, I chose Fort Wayne, Indiana, which is a four-hour drive from Washington to Fort Wayne. If you can imagine on the weekends, what we would do is—I would get off work early. I’d pick up Luke right after school. —told him everything that he had done wrong. Dennis: So, what would you say to a dad—or for that matter, a highly-competitive mom—who is really pushing and pressing their daughter or their son to really excel and to move to the next level? This can happen in all kinds of sports—soccer, football, basketball, baseball, gymnastics—doesn’t matter. Steve: Wait until they ask because, once they ask, they’re willing to listen. The other thing I would advise is: “Be careful of the car rides because you have their undivided attention. “One of the worst things you can do is make that car ride, to and from, miserable.” But as far as pushing them to the next level, just spend time with them. Go there and let them see how much you enjoy just being with them. Just give them the support and let the coaches do what they need to do—and that’s really the bottom line. Bob: We’re talking with Steve and Lorri Zeller, whose sons, Luke, Tyler, and Cody, either are playing or have played in the NBA. They have written a book called Raising Boys the Zeller Way. Lorri: I think the desire to play came from them because basketball has always been something for them that is fun. It wasn’t something that we made them do. We did put them in the right places, but we were also careful about some of the parameters that we put on that. We—you know, they weren’t on big, high-powered teams that flew somewhere every weekend. Bob: Did any of them ever come to you, at any point during their growing up, and say, “I’m not sure I want to play this year—maybe, just take a year off”? Steve: If you can envision all the accolades that Luke was getting in—up for Mr. Basketball, McDonald’s All-American, being recruited by Division 1 schools. Tyler wasn’t getting any interest at all. With that, he got to the point where he wasn’t very excited about basketball. He got cut from the JV team—played the freshman basketball. During that freshman year, he grew from 5’11” to 6’7”. So, he went right from freshman to varsity in his sophomore year. He started varsity in high school. Bob: Did he keep playing because you urged him to; or did he ultimately say, “No, I guess I do want to play this year”? Dennis: Lorri, Steve talked about something that was significant as he raised those boys. Was there a point that you had a take-away that was a major component of how you would be a mom to three high-performing young men? Lorri: I think it was just the consistency of being there for them. We’ve talked a lot about unconditional love. You know, if you’re a parent raising kids, it’s a roller coaster—you know, parenting is a tough job. I think it’s just that consistency and showing them that you are there for them—you support them unconditionally. For me, it was just—I’m a really organized person. I was kind of the traffic controller that kept everybody on schedule and going in the right direction. That was kind of my role. Bob: You had two simple rules for the boys. Tell our listeners what those rules were. —I thought: “That’s interesting. He worked for Oscar Mayer. He made hot dogs for Oscar Mayer and turned out three of them for the NBA.” [Laughter] I love it! I thought that was really good—a couple—or three / a trio of 7’-NBA stars. Bob: And I think it’s important to say—not only are they NBA athletes, these guys were straight-A students; right?—all of them? Bob: And they had other interests. It wasn’t just such a lock-downed focus on basketball at your house that nothing else mattered; right? —third place / didn’t have to give a speech. Bob: But he’ll do the post-game interview today if he’s called out a star of the game; won’t he? Lorri: Yes. So, they can speak. And then, Cody came along and thought Tyler was pretty wise. He was going to do that same thing. So, Cody got an A-minus, and Cody ended up with a 3.99, which would have been good enough for third; but he happened to tie for second. So, he was also a salutatorian—had to give the speech. But they did really well in academics, but that was something that we really emphasized, growing up—was: “Your academics come before sports. So, if you don’t have homework done, you’re not going to practice.” We were really strict about things like that, and it paid off. They really did well in college as well. Dennis: I think one thing that you all model—that you talk about a great deal in your book—is you modeled the component of character—talking about doing what’s right and being God’s man. I think today, more than ever, parents need fresh reminders of what that looks like in a very tough culture to raise children. 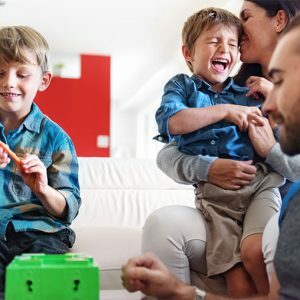 And I think your book, Raising Boys the Zeller Way—certainly, isn’t a recipe for your kids to be 7’0” tall and play in the NBA or the WNBA—but it is a great exhortation to equip parents to be better parents in a time when we need great families. Luke and Tyler and Cody Zeller. We’ve got the book, Raising Boys the Zeller Way, in our FamilyLife Today Resource Center. You can go online at FamilyLifeToday.com to request a copy; or you can call 1-800-“F” as in family, “L” as in life, and then the word, “TODAY.” So, again, the website is FamilyLifeToday.com; or call 1-800-FL-TODAY. Here, at FamilyLife, we are all about anniversaries. We want to see couples celebrating more and more anniversaries, year in and year out; and we want them to be happier anniversaries every year. We are the Proud Sponsor of Anniversaries™. We’re celebrating our 40th anniversary this year, and we’re doing it by stopping to thank God for all of the anniversaries that He has allowed us to be a part of in the 40 years that FamilyLife Today has existed. So, let me say a quick, “Thank you,” to those of you who partner with us and help make all this ministry possible. We’re grateful for your financial support. We’re listener-supported; and without your joining with us, FamilyLife Today would not exist. And if you can help us with a donation today, we’d like to say, “Thank you,” by sending you a copy of the book, Becoming a Spiritually Healthy Family: Avoiding the 6 Dysfunctional Parenting Styles. It’s our thank-you gift when you go online at FamilyLifeToday.com to make an online donation or when you call 1-800-FL-TODAY—make your donation over the phone and request your copy of the book—or mail your donation, along with the book request, to FamilyLife Today at PO Box 7111, Little Rock, AR; our zip code is 72223. —then, about a month before your anniversary rolls around, we’ll send you some ideas on how you can express your love to one another in some special ways during your anniversary this year. 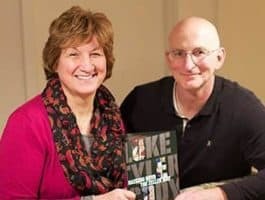 Now, tomorrow, we’re going to continue our conversation with Steve and Lorri Zeller as we talk about what it looked like for them to raise their tall sons, who all three played in the NBA. Hope you can tune in for that.